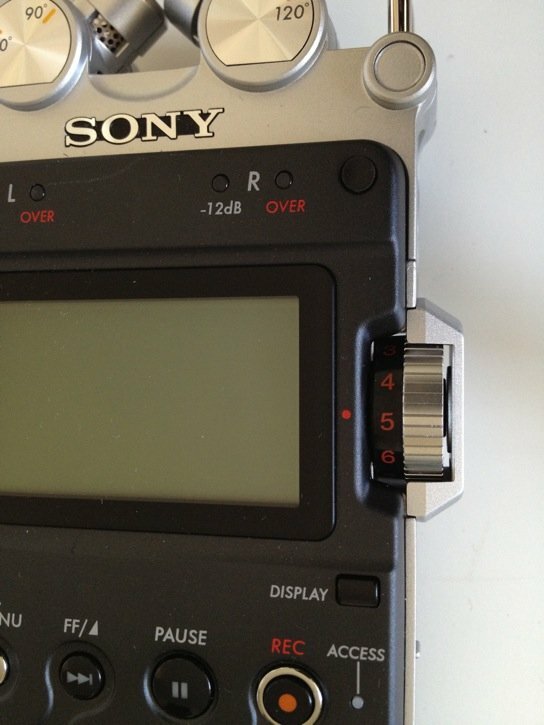 This article continues the Sony PCM-D50 review for stealth sound effects field recordings. Last week we looked at why Airborne Sound chose the D50, its key features and listened to sound samples. This week we’ll look at more detailed features, and see how they help or hinder field record stealth sound effects specifically. In our final article about the D50, we’ll challange a Zoom H4n for an audio shootout. Does the D50 sound good? Yes, definitely. Is it portable and well-built? Yes. These are the key considerations. However, when professionals use tools for a sustained time, thoughtfully-designed features can make a pro’s job easier. This allows them to focus on being creative. Considerate design becomes important. My first impression when recording with the D50 is that this recorder is in a class far different from other, less expensive recorders, and even dedicated pro recorders. The D50 looks and feels professional. Where others are plastic and rubber, the D50’s chassis is aluminum. The buttons, display and LEDs all feel refined. In a design sense, I was puzzled by the abundance of switches. I mentioned this a bit last week. There doesn’t seem to be any method to the switch locations (low cut, limiter, line/mic, attenuation, etc). They’re strewn all over the device. For example, it’s a bit odd that the low cut and limiter are on the bottom of the unit. While these functions are generally something you set once and leave, the scattered layout leads me to believe the recorder was designed primarily as a studio or desktop recorder in a stable environment. However the unit feels elegant. You certainly feel what the recorder’s price premium pays for. Part of this is in the display, which, even for one designed in 2007, has a larger, clearer and more detailed display than comparable recorders, even those made since. I appreciated the level meter, which is more fine that other portables. It is also paired with a numbered maxium peak value in dBFS. Other nice touches are the time remaining display, remaining memory amount icon and green and red peak level lamps. I don’t feel that the interface and transport controls are well suited to stealth field recording or any kind of rugged use. It’s difficult to use blindly, which is commonly required in stealth situations. The layout of the transport is in two rows. Often recording stealth requires finding controls by touch only. While the record, play and light button have distinct shapes, the differences are slight. Punching in requires pressing record to arm, then play to punch in (or both together for immediate punch-in). It just feels clumsy. Something quicker or simpler would be appreciated. As for the buttons themselves, I’d prefer the action be firmer and deeper. They barely sink and I feel accidental presses could be a problem. Admittedly, these details are finicky. While I’m nitpicking, I’ll mention that accessing the menu design system involves pressing and holding a button on the front near the transport (easily brushed when looking for controls?). Some kind of jog wheel with dedicated menu scrolling and section buttons (i.e. like the classic iPod scroll wheel) would be far better than its current method of using play and fast forward. Other recorders have a wheel- and button-based menu system and I feel this is more intuitive. Of course, it’s unlikely the D50 was developed for stealth. 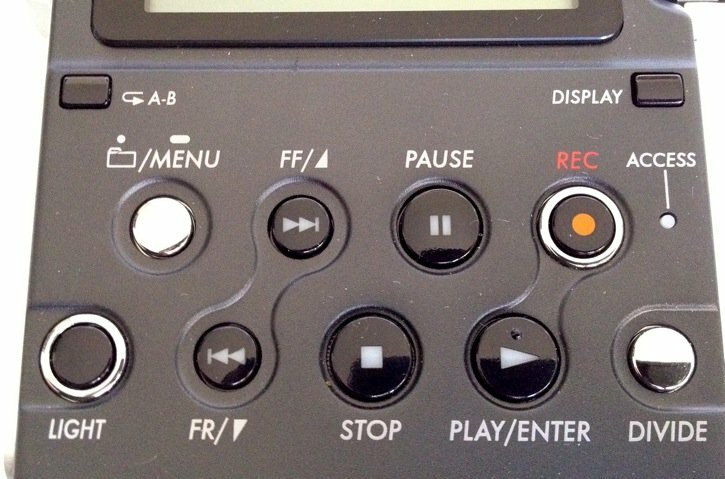 The feel and action of the transport controls and the menu system seem to support that this is a desktop recorder. The analog volume and level are far better than rocker switches on other models. A plus would be to have the level displayed (i.e. 1-10, in addition to the peak) on the display. The level number is displayed only on the wheel in bewildering colour selection of red on black. You can’t see the wheel’s level numbers during night shoots. This is a problem because sometimes you need to set levels before you have any reference level on the meters. A visual indication on the display would be helpful. Start-up is relievingly fast: about seven seconds. (The Zoom H4n with a partially used 16 Gb card takes 27 seconds.) Having a portable recorder means I’m often pulling it out to capture suprise sound effects. Paired with the quick punch-in option, the D50 is that much quicker capturing sudden sound effects. Another excellent feature to help with this is the five second pre-roll. The divide transport button also helps creating new tracks with one press. There’s no need to punch out and re-arm. Other cool features I liked: a dedicated light button (others set this in menus only), and auto-shut off. What about batteries? The D50 uses 4 AAs, and runs incredibly long. It’s nice, but I feel this isn’t really that important. I can’t imagine too many field recording trips running constantly for more than 5 hours at a time, and any other portable recorder with just 2 AAs lasts that long anyway. If you’re away from a charger for days I could see the enhanced power duration could be helpful. How about inputs/outputs? One glaring omission is the lack of professional input and output jacks. Input, output and headphone output are all 3.5 mm jacks. While adapters could work, I’d suggest that the recorder isn’t meant to work this way. 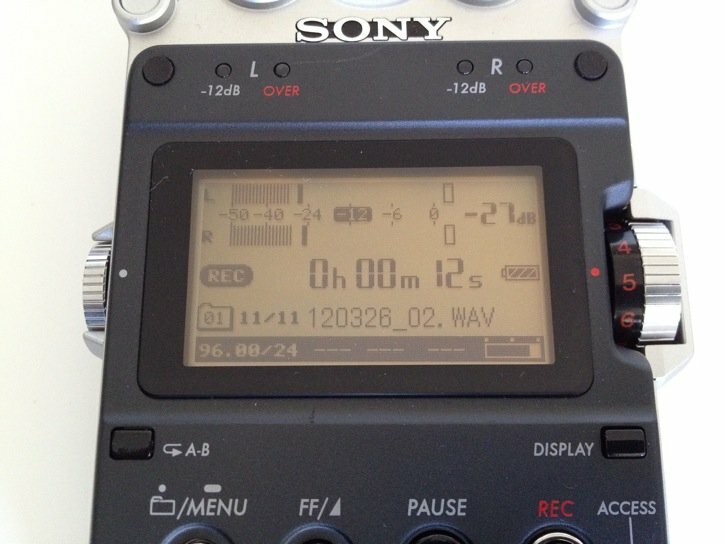 I used an external Sonic Studios DSM 6S/EH with the recorder. You can listen to the results in the article I posted last week. If you’re looking for a recorder with XLR inputs, you’re better off spending money on a professional recorder that has them, that will provide a superior preamp to take advantage of microphones you’ll connect to it. View the Sony PCM-D50 as high-end portable recorder. I wouldn’t suggest it for a replacement for Sound Devices recorder or anything similar. If you have a big budget and want the best portable sound you can get for under $1000, the Sony PCM-D50 is your top choice. It’s a fantastic recorder, and the quibbles I’ve listed shouldn’t deter you from appreciating the sound quality it produces, or its contruction. Another way to look at it is what you can get for the same cost. Sony lists it on their site for $599, but it can be found cheaper. The D50 retails on B&H for $469. A windscreen and shipping will round that up to roughly $525. That’s a lot to spend on a backup recorder. It’s difficult to justify that price unless you require the sound quality for specifically with a recorder of that size. It may make more sense if it is your primary recorder, and one you plan to use for years. But what else can you get at that price? The Fostex FR-2 LE is $599. It doesn’t have a microphone, but it has XLR jacks that will allow you to use external microphones. I haven’t heard the preamp on the FR-2 LE, but that would be one key thing you’d need to compare, as well as the additional expense required to buy a microphone. The Zoom H4n is perhaps the closest in form factor, popularity and quality. It’s priced at $299. Let’s say it’s $350 with windscreen and shipping. If you consider the price, is the D50’s value worth spending $175 more? Some may say that excellent sound quality is priceless. But is the D50 33% better than the Zoom H4n? We’ll see next week when we throw the D50 and Zoom H4n in the ring together for a audio recorder shootout.